No, really, I do like entertaining. I know I have tendencies towards the antisocial (No! I hear you cry in shocked amazement), but I really like having friends over for a meal. I like planning what to feed them, I like them to bring kids over to play with mine and have them all end up in the pool, I like to compare notes on other ways of being mums and dads, wives and husbands, breadwinners. Because it’s a joint effort, there’s a point in the entertainment where my dear husband has to put meat over a flame. Unfortunately our elderly barbecue caught fire a few weeks ago, and there was nothing we could do except push it into the middle of the verandah and wait for the conflagration to die down, then put the corpse out in the cleanup. That meant that some ingenuity was required to satisfy the primitive in my life’s companion while entertaining English friends today. We dug out the old Weber from under the house, filled it with bits of old fence and put the rack from my precious new oven over the glowing coals that resulted (who knows where the original grill got to). It actually did a reasonable job. We quite liked the idea of cooking on an old fashioned style barbecue, one that wasn’t plugged in to anything. We didn’t cook anything fancy, my man likes his meat straight. He will occasionally condescend to barbecue a prawn, but there was no way I was going near any fishmonger this time of the year. A jolly afternoon was had by all, and after the debris was cleared away, I realized that if I was going to be providing dessert for our large family Christmas, I may want to add one or two things to the baked goods already prepared. So tonight I’ve done a pan of brownies (I’m pretty sure you’ll find that one on the blog), a custard tart that looks like it may have actually worked!! and am about to begin the first step of what I traditionally bring to Christmas – cinnamon rolls. I’m pretty sure cinnamon rolls will be blogged about tomorrow if I get a moment to steal away from the hordes of children. So that’s how I spent Christmas Eve, doing two of my favourite things. Sharing a meal with friends and baking for the the people I love. That’s uncharacteristically sentimental of me, is it not? Although if anyone else pops up claiming to be bearing the TRUE meaning of Christmas I shall go so far as to gnash a tooth or two. Looks like it’s time to take that tart out of the oven, I can’t believe I’ve finally made one where the custard hasn’t been eaten by the pastry! 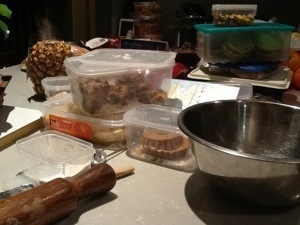 What I’m not going to be doing tonight is cleaning up my kitchen, that can wait until Boxing Day. This is what it currently looks like. I have big plans for that pineapple. Something else to stay tuned for.